In my excitement over the Southern Poverty Law Center's mention of Sam Harris I neglected to mention the Steven Pinker connection. The number of times each individual or platform was mentioned as an influence was tallied, and those mentioned by three or more posters are listed in the chart below. Disconnected as they might seem, the most cited influences — the “politically incorrect” 4chan board /pol/ and the American Renaissance editor Jared Taylor — hint at two common paths to the alt-right: either through participation in the rampantly racist and misogynistic online trolling culture of 4chan and its offshoots, or through exposure to Taylor’s variety of pseudo-academic “race realism” that couches timeworn racist tropes in the language of science. Within alt-right spaces like TRS, these two fibers of the movement are woven together — resulting in an ironic, meme-ified version of old-school race science — and embellished with antisemitism. Here is the chart provided by SPLC below. 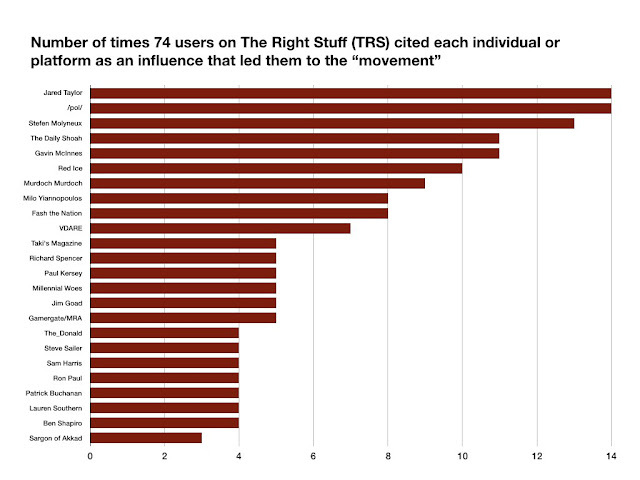 It doesn't surprise me at all that many of the names who influenced those joining the alt-right also appear in my diagram Steven Pinker's rightwing, alt-right and hereditarian connections: Jared Taylor, Stefan Molyneux, Gavin McInnes, VDARE, Taki's Magazine, Richard Spencer, Steve Sailer and with my updated chart, Sam Harris. I find it especially interesting that Harris and Sailer have the same number of citations. The SPLC is only reporting the data collected at this right-wing group, but Sam Harris considers reporting the data a sign of the "stupidity" of SPLC. 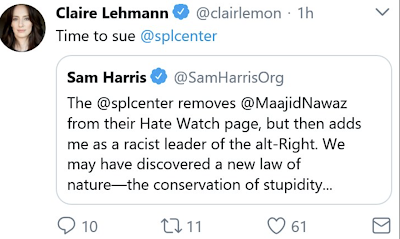 And of course science racism promoting ninnies like alt-right Claire Lehmann (also on my Pinker chart) are going to support Harris. 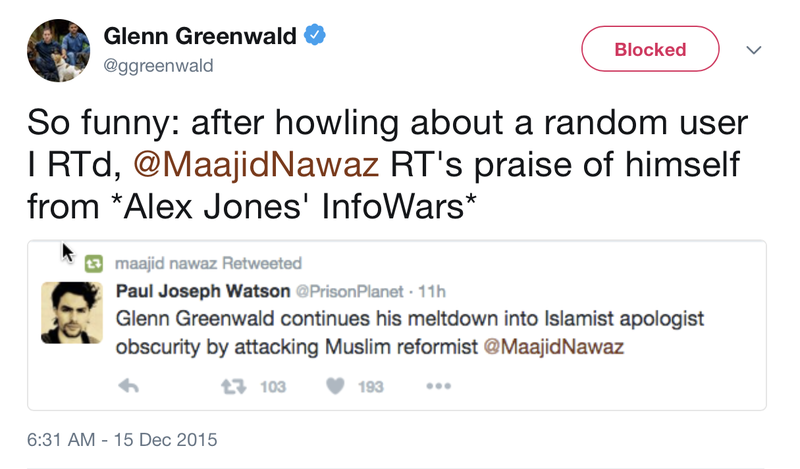 Harris's tweet refers to Maajid Nawaz who sued the SPLC for calling him an anti-Muslim extremist, but I doubt he believed he could win - the SPLC calling Nawaz an anti-Muslim extremist was an opinion. And they have plenty of reporting about Nawaz to back them up. But even if they didn't, the fact remains that opinion is protected by the First Amendment in the United States. I think Nawaz's real goal was to hurt SPLC financially. Certainly his fans at InfoWars would love that. 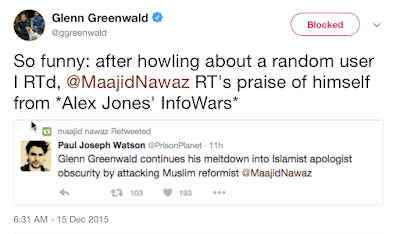 Back in 2015 Nawaz had no problem with InfoWars as Glenn Greenwald discovered.